Also known as TrackMania Original and TrackMania Power Up! Has problems running on modern machines. See Update StarForce for operating systems newer than Windows XP and Issues fixed. Upgrade TrackMania to TrackMania Power Up! Download the TrackMania Power Up! installer. Extract the .zip file and run the TrackMania_PowerUp_Setup.exe. Proceed through the setup wizard and run the game. 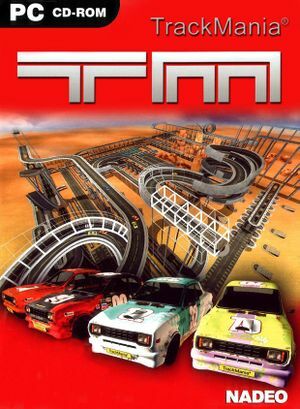 Download the TrackMania Original installer. Extract the .zip file and run the tmoriginal_frompowerup_setup.exe. Download the TrackMania Original 1.5.2 update. Extract the .zip file and run the tmo_150_to_152_cd.exe. TrackMania Original is required to be version 1.5.2 in order for the StarForce version to be updated. 2x, 4x, 8x, and 16x. Offical Dedicated Server available from Nadeo. "Local Internet Connection" option in "Multiplayer" in-game. Default port: 2350. Forcable IP address option along with server port. Extract, then copy and replace all files in the <path-to-game> folder from the .rar file. TrackMania Original must be version 1.5.2 or else the game will not work. 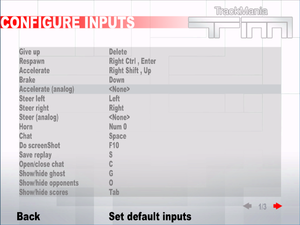 Newer hardware configurations can cause the game to freeze and remain at a white screen. Download dgVoodoo 2 and unpack it. Copy d3d8.dll, ddraw.dll, d3dimm.dll from the MS folder and the dgVoodoo.exe to <path-to-game>. Run the dgVoodoo.exe and click the forward-slash "/" in the top right-hand corner of the window. Click "Apply" then "OK". Change the settings in the "General" tab according to your hardware. Under the DirectX tab, there are different video cards to select. Tick "Fast Video Memory Access"
Download WineD3D and extract it. Copy d3d9.dll, libwine.dll, and wined3d.dll into <path-to-game>. This page was last edited on 13 April 2019, at 00:52.